Welcome to Hog’s Australia’s Steakhouse Aspley! Hog’s Aspley is serving up the best steak available in North Brisbane. If you’re on your way from Aspley State High School or the Aspley Hornets Football Club, we’re just around the corner! Come by, put your feet up, and tell us how you want your steak done (or your fish, chicken, or salad). Our Staff and the Hogster mascot love having a good time and kickin’ it with the locals. Families love it too because kids eat free* ALL day on Monday and Tuesday! 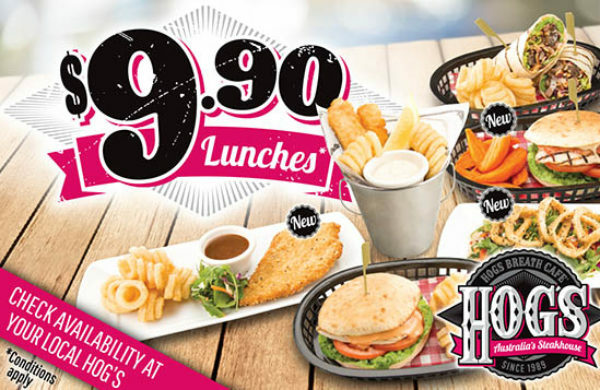 Enjoy takeaway and lunch specials (only $9.90!) seven days a week! If you’re in the mood for a good time and to be surrounded by friendly, happy people, then this is the place for you. The Hog’s dining experience is made complete with entertaining memorabilia and antiques that line the venue. Hog’s Australia’s Steakhouse is happy to be Aspley’s neighbourhood restaurant, providing quality food in a friendly, upbeat atmosphere. For sure, there is no place like Hog’s! Hog’s Australia’s Steakhouse Aspley loves making kids laugh and having a good time! Our mascot Hogster visits children’s parties and attends the annual Aspley Fete. We also help sponsor the West Arana Hills Club, Shaw Sports, and multiple charities in the region. We feel supported by you and give back to the community in return!